Cor-Bon has been manufacturing ammunition since its founding in 1982 in South Dakota. 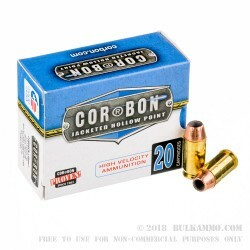 Besides these Jacketed Hollow Point rounds, Cor-Bon also manufactures other types of defensive ammo for Law Enforcement use and for civilian use. They are currently well known in the defensive ammunition industry for their innovation and outside the box thinking in the world of ammo design. This 45 ACP ammo features Cor-Bon's Jacketed Hollow Point (JHP) bullet in 185 grain weight, with a +P power factor load, and reloadable non-corrosive Boxer primed high end sorted brass cases. 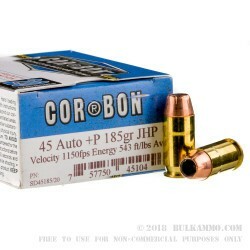 These Cor-Bon 45 ACP cartridges run at a faster than usual rate for a 45 ACP round. They have a muzzle velocity of 1150 feet per second and a muzzle energy of 543 foot pounds. 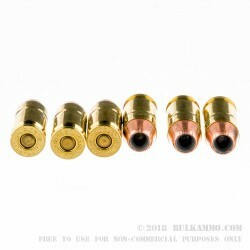 Their Jacketed Hollow Point bullets have a reliable expansion rate, and well documented terminal depth performance and cause a large temporary cavity. You don’t see Cor-Bon rounds in bulk packs very often. 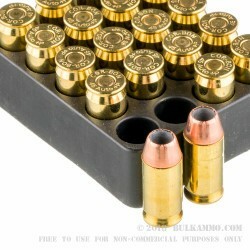 They usually come in single 20 round boxes, but these come in large packs of 25 boxes with 20 rounds in each box, making for a grand total of 500 rounds in each case. This is a great deal on top of the line defensive ammo, pick up yours today.